Indian Motorcycle to Sponsor Inaugural "Veterans Charity Ride to Sturgis"
MEDINA, MN--(Marketwired - Jun 19, 2015) - Indian Motorcycle, America's first motorcycle company, today announced its sponsorship of the "Veterans Charity Ride to Sturgis." The ride, intended to raise support for severely wounded and injured veterans, will offer a select group of former military service members the opportunity to ride to Sturgis, SD just in time for the rally's 75th anniversary. Indian Motorcycle recently announced a partnership with the USO, a nonprofit organization dedicated to providing programs and live entertainment to the U.S. troops and their families worldwide, and today is expanding its commitment to those who served. In addition to sponsoring the ride, Indian Motorcycle is providing the service members with bikes to ride to Sturgis. Several of the Indian models have been outfitted with sidecars specially built and provided by Champion Sidecars to accommodate the riders who are unable to operate a motorcycle themselves due to multiple traumatic amputations. "In the same way we are inspired by the courageous and selfless commitment these men and women made defending our country, we are honored to help each of them achieve their dream of riding to Sturgis on an Indian Motorcycle," said Scott Meek, marketing director for Indian Motorcycle. More than a dozen veterans, from various military branches and of varying ages, will start their weeklong journey to Sturgis from Los Angeles. The trip will be filled with exciting locations and routes on their epic journey to the Black Hills Rally in Sturgis. The group will spend six days riding spectacular scenic backroads and exploring some of America's greatest national treasures including Zion National Park, Bryce Canyon, Grand Staircase-Escalante National Monument, Capital Reef National Park, The Arches and Moab, Utah. From Utah the group will continue their journey through the Colorado National Monument, Hahn's Peak Colorado and Medicine Bow National Forest in Wyoming, arriving in Sturgis on Sunday, August 2. At the rally, they will enjoy the ultimate Sturgis experience. America's First Motorcycle Company takes special pride in its long-standing relationship with the Sturgis Motorcycle Rally, which was started by Indian Motorcycle dealer "Pappy" Hoel in 1938. The riders will be treated to several activities sponsored by Indian and its partners, including participation in the Buffalo Chip's "Freedom Ride" on Thursday, August 6 along with 600 fellow veterans. Indian Motorcycle has partnered with Emmy award-winning Director Robert Manciero and his production company, Full Vision Productions, to create this adventure and film the entire journey. "We are honored to be putting on this event and campaign in support of Indian Motorcycle and the service members who have given so much for our country. We have created a fantastic, weeklong ride with activities and excursions planned along the route in addition to chef-prepared special meals and visits with other veterans and organizations," said Manciero. "Attending the Sturgis Bike Rally has been on my bucket list for many years, but riding to the 75th anniversary with my fellow veterans on an motorcycle is a dream come true," said Los Angeles-based Jorge Hernandez, a veteran Marine with 12 years of service, two Purple Hearts and four deployments to Iraq and Afghanistan. Full Vision Productions has created a unique, interactive media platform to chronicle the epic ride. It will enable fellow veterans, motorcycle enthusiasts and other supporters to follow the riders and campaign in real-time, interacting with them via Facebook, Twitter and Instagram and watching daily videos of their journey. Riders who are on their way to Sturgis for the rally will find the itinerary for each day posted on the site should they wish to join the ride and support the riders on their once-in-a-lifetime journey. For more details about the campaign, videos and specifics of the route and excursions visit the Veterans Charity Ride official website at www.veteranscharityride.org. 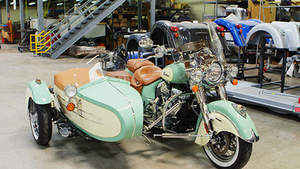 Indian Motorcycle, a wholly-owned subsidiary of Polaris Industries Inc. (NYSE: PII), is America's first motorcycle company. Founded in 1901, Indian Motorcycle has won the hearts of motorcyclists around the world and earned distinction as one of America's most legendary and iconic brands through unrivaled racing dominance, engineering prowess and countless innovations and industry firsts. Today that heritage and passion is reignited under new brand stewardship. To learn more, please visit www.indianmotorcycle.com. Indian Motorcycle is sponsoring The Veterans Charity Ride to Sturgis, which includes veterans from all branches of service, and is providing the bikes for this journey including several Indian Chief models outfitted with sidecars to accommodate severely injured veterans. The Veterans Charity Ride to Sturgis begins July 27th in Los Angeles.